PLEASE NOTE: WHETHER TO CHOOSE A SMALL OR A BIG CAT BIB IS BASED ON YOUR CAT'S AGGRESSION NOT ON THE SIZE OF YOUR CAT. The CatBib is a unique, patented product that prevents your cat from catching and killing wild birds... simply, safely, effectively, and inexpensively! AND it's been scientifically proven to stop cats from catching birds! Invented by a backyard bird-feeding, cat lover. 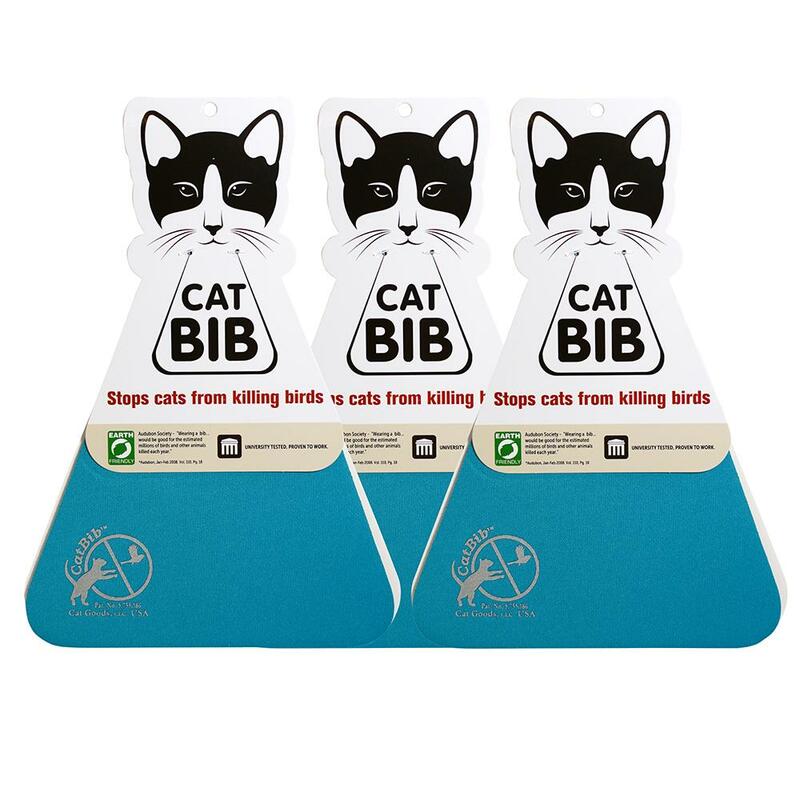 The CatBib gently interferes with your cat's hunting skills, without interfering with any other kitty activities. It acts as a barrier coming between your cat and the bird your cat is after. Simply put...it gets in the way just as the cat strikes out for the bird. Additionally, because birds see in color, it also functions as a colorful visual warning to the birds. The birds are more apt to see the cat, before the cat gets close enough to attack. A simple solution to a big problem. Just as importantly cats can run, jump, climb trees, eat, drink, and be merry in their CatBibs. The actions your cat uses to make that final lunge at a bird is what activates the CatBib to work only when it's attempting to catch a bird. They can enjoy the outdoors, get exercise, fresh air and sunshine. The only thing they can't do is kill birds! The Murdoch University CatBib trial also showed that the CatBib reduces small mammal predation by almost 50%! The CatBib folds over your cat's collar and is secured by hook and loop closures for easy on/off action. Specially designed to slide easily over the collar and hang loosely over the cat's chest. Comfortable and safe for your cat to wear. 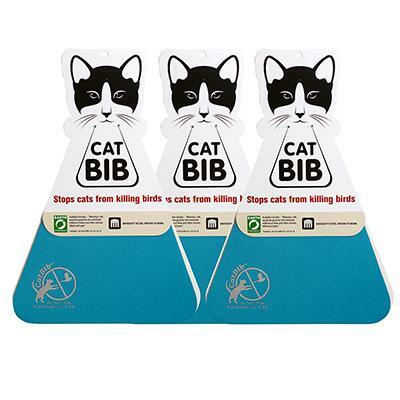 The CatBib is made of thin neoprene which is light-weight (less than an ounce), stretchy, durable, and easy to care for. Wipe off with a damp cloth or machine wash.
UPDATE! Murdoch University, the university that tested the CatBib and proved that it worked recently published a press release of that research. The manuscript has been accepted for publication in the scientific journal Biological Conservation.